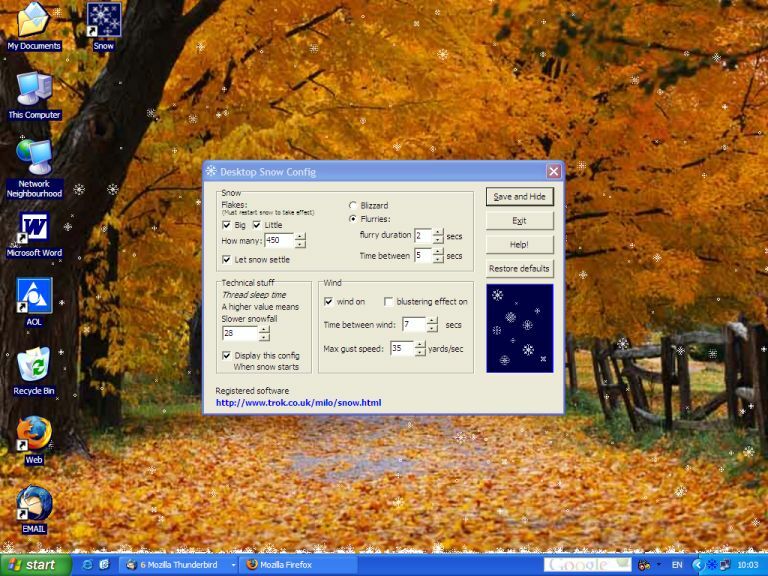 Desktop Snow for Windows is a small Windows XP / NT / 2000 program that makes it snow on the desktop behind your windows, while you work. It does not interfere with your computer at all. It does not contain ads. Installation is simple, via a simple installer (450Kb). The shareware version is fully functional. It does not expire, but displays a small nag-screen reminding you that it is shareware, when the program starts and when it stops. 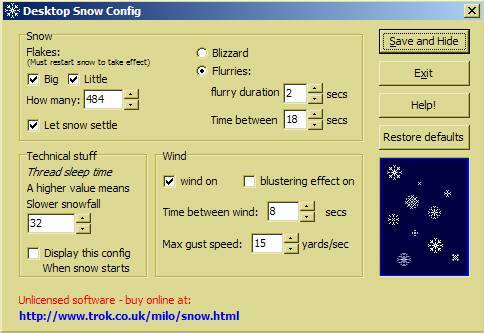 You can customize it: you can choose either a blizzard or flurries that come and go. You can alter the number and type of flakes that are falling. You can alter the wind speed and the wind characteristic. You can choose whether to let the snow pile up at the bottom of the screen or not. NB: The program works if you have the Windows Active Desktop enabled and locked. You probably do anyway, but if you don't, the program will detect that and display instructions. Immediately after installing, you should right-click the desktop, select "properties" from the menu then in the window that appears, click "ok."
Order Securely Online Now For £6 GBP (Approx: $10 USD) All cards and PAYPAL accepted. Upon successful payment a download link will be displayed. Payment is courtesy of the thawte certified site BTM Micros, Inc. Copyright (c) Milo Krajicek, 2005.